Fully immerse yourself in Greek culture. For over 40 years, the annual St. Demetrios Greek Festival has featured authentic traditional Greek food, music, dancing and libations. The multi-day community event is held every November on the Halifax River at St. Demetrios Greek Orthodox Church on Halifax Avenue in Daytona Beach. The event is free and open to the public, which includes parking and shuttle service. Enjoy the sounds of traditional Greek music like the Hasapiko, Zeibekiko, Tsamiko, Sirto and Pentozali while the church’s Saint Demetrios Dancers perform folk dances in costume. A family-friendly, indoor and outdoor event, the annual St. Demetrios Greek Festival also boasts authentic Greek cuisine created from family recipes including gyros, fried calamari, pork souvlaki, moussaka, spanakopita and stuffed grape leaves. There’s even a fresh and frozen prepared foods section to purchase your favorites to bring home and share. Don’t forget the sweets! Specialty prepared desserts include baklava, melomakarona (honey walnut cookies), semolina pudding and kourabiethes (almond shortbread cookies). Relax in the coffeehouse, enjoy a beer or glass of ouzo at the Taverna or sip wine at one of the riverfront tables. 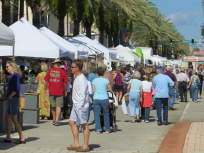 There’s also the marketplace where you can browse craft and souvenir booths full of Greek-themed gifts and jewelry. The Greek Festival is a decades-long tradition and one of Daytona Beach’s most popular attractions – bringing thousands of revelers to take part in traditional and authentic Greek culture.